What is the US government's historical role in the universal fight for human rights? How have the Executive and Legislative branches perceived the role of human rights in US policy? What battles are fought within the US government when it comes to preserving human rights and documenting abuses in "friendly" countries? What urgent human-rights challenges do we face in the next decade? As US Assistant Secretary of State for Democracy, Human Rights, and Labor in the Clinton Administration, our guest, John Shattuck, was the US Government's chief human-rights official from 1993 to 1998. 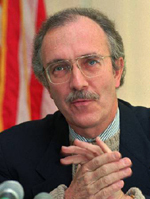 He also served as the US Ambassador in Prague from 1999 to 2000. Before entering government, Ambassador Shattuck was Vice President for Government, Community, & Public Affairs at Harvard. Prior to that, he worked for the American Civil Liberties Union as Executive Director of the Washington office and national staff counsel from 1971 to 1984. Ambassador Shattuck is now the Chief Executive Officer of the John F. Kennedy Library Foundation in Boston. Among the numerous honors he has received for his work is the International Human Rights Award from the United Nations Association. His book, Freedom on Fire: Human Rights Wars and the Roots of Terrorism, will be published this year by Harvard University Press. Ambassador Shattuck will be introduced by Paul Parravano of the MIT Office of the President. The discussion will be moderated by Jeff Ravel, professor of history at MIT. Co-sponsored by the MIT Large Event Fund; the History Faculty; the Department of Political Science; the Anthropology Program; and the Program in Writing & Humanistic Studies.